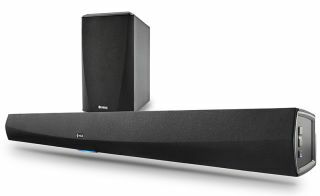 Denon adds HomeCinema soundbar and sub to HEOS multi-room system | What Hi-Fi? Denon has expanded its HEOS multi-room range of wireless speakers, with the addition of the HomeCinema soundbar and wireless sub. Promising "true high fidelity sound", the slim soundbar packs dual 2in x 5in precision drivers and dual 20mm dome tweeters, while the matching wireless sub offers dual 5.25in woofers. The soundbar can be placed on a shelf or wall-mounted, and you can choose to place the sub horizontally or vertically depending on your set up, much like the Sonos Sub. Connectivity is well covered, with one each of HDMI, optical, coaxial and aux inputs, as well as USB and ethernet ports and HDMI ARC output. There's Dolby Digital, Dolby Digital Plus and DTS decoding on board too, as well as Denon's own Virtual Surround processing. As with the rest of the range, the HomeCinema can be controlled using the HEOS app, which gives you the opportunity to tweak bass levels, choose between Movie and Music DSP modes, enhance dialogue or turn on Night Mode for dynamic range control. Also officially unveiled was the HEOS 1, a small, waterproof speaker, which is available with an optional battery pack - the HEOS 1 Go - to make it portable. We first heard about the HEOS 1 last month. The HEOS HomeCinema and wireless sub will be available in July for £599, while the HEOS 1 speaker is expected to sell for £199. The HEOS 1 Go battery pack will be available separately for £79.